Poroshenko met with the IMF chief in Davos. The Director of the International Monetary Fund Christine Lagarde said the final technical issues of granting Ukraine the next tranche can be resolved within the next few days. "I have every reason to believe that the last few technical details that need to be addressed in the next couple of days, will lead to a real positive result... I hope by that time we will fulfil all the requirements and hope that the revision will be completed by then," Interfax-Ukraine quoted Lagarde as saying after a meeting with President Petro Poroshenko in Davos on 19 January. 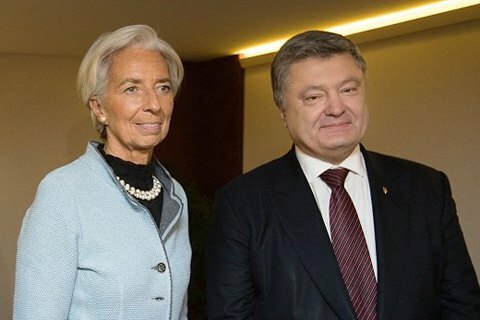 Lagarde said that the meeting with Poroshenko was very productive. "We've just finished a very effective meeting with Mr Poroshenko, during which we discussed many reforms and their progress, implemented by President Poroshenko and his team," she said. Earlier, Finance Minister Oleksandr Danyluk said Ukraine will receive the fourth tranche of the IMF in early February.